Aric Almirola started Stage 1 in the fourth position at Kansas Speedway, his best qualifying position of the season, and completed it in the sixth position. Almirola made his first pit stop of the evening from the sixth spot during the competition caution on lap 30. He received fuel and four fresh Goodyear tires after reporting the No. 10 Smithfield Ford Fusion was neutral. The Tampa native restarted seventh on lap 35 and finished the first stage in the sixth spot to earn five bonus points. Before the start of Stage 2, Almirola visited pit road for four tires, fuel and an air pressure adjustment. He started the second stage in the sixth position and ended the stage in sixth to accumulate five bonus points. Almirola’s No. 10 Smithfield Prime Ford Fusion continued to maintain a top-10 running position. On lap 123 he made a scheduled green-flag pit stop for fuel and four tires after reporting the No. 10 Ford’s handling was tight. The 34-year-old maintained the seventh position for most of the stage but was able to gain one position as Stage 2 came to close. During the caution period for the final stage break, Almirola visited pit road for fuel, four tires and adjustments, and began the final stage from the sixth spot. On lap 213 Almirola made a scheduled green-flag pit stop from the seventh position for fuel, four tires and adjustments to help with the No. 10 machine’s handling. After the field cycled through green-flag pit stops, Almirola was running in the ninth position. During the fifth caution of the race, Almirola had to visit pit road twice and restarted in the 15th position on lap 252. Just after the restart the sixth caution came out for a multicar accident, and subsequently the red flag was displayed for approximately 13 minutes. After the red flag was lifted, Almirola restarted 11th on lap 258 and worked his way up to ninth, where he ultimately finished. This was Almirola’s fifth top-10 of 2018. 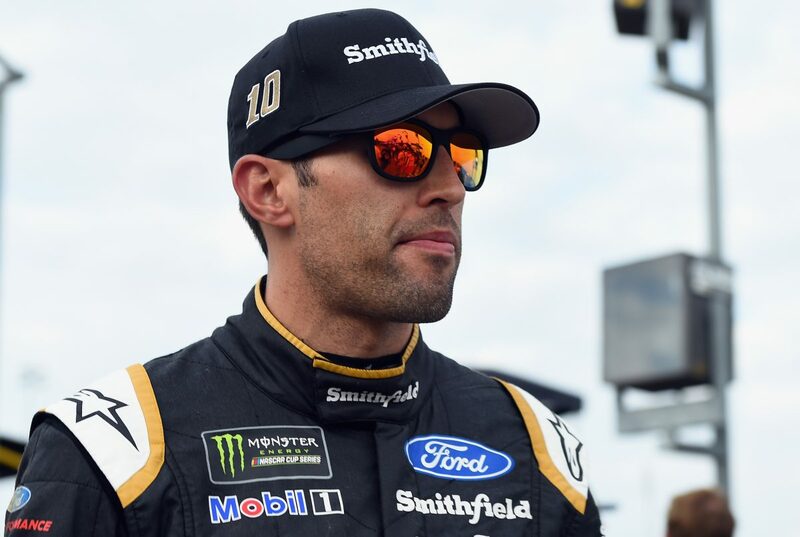 Almirola earned his fifth top-10 in 13 career Cup Series starts at Kansas. Almirola finished sixth in Stage 1 to earn five bonus points and sixth in Stage 2 to earn an additional five bonus points. This was SHR’s ninth Cup Series victory with Ford. The team won its first race with Ford when Kurt Busch captured the 2017 Daytona 500. The next event on the Monster Energy NASCAR Cup Series schedule is the non-points Monster Energy NASCAR All-Star Race on Saturday, May 19 at Charlotte (N.C.) Motor Speedway. The race starts at 8 p.m. EDT with liver coverage by FS1 beginning at 5 p.m.